You are buying a Incipio Watson Wallet Folio with Removable Hard Shell Case for iPhone 5c - White - NEW OPEN BOX. Case will fit iPhone 5c. AT&T iPhone 6 Case Ultra Slim 360 Full Body Tempered Glass Plating Mirror Cover. Paris Tower Horizontal Flip Handmade Leather Case Cover For iPhone 4 4S. Purple/Black New Premium Hard PC Flexible TPU Kickstand Hybrid Case For iPhone 6. Note:This case is fit for Apple iPhone 5C. not fit for other models. All slots for iPhone is accessible without removing the case. - Perfect Design and high quality Leather Pouch Case. Compatible model with iPhone 5/ iPhone 5S/ iPhone SE. 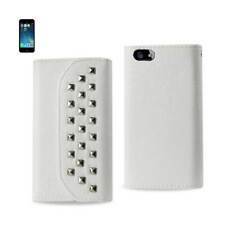 iPhone SE/5S/5 Studded Leather Wallet Case with Card Pockets in White. Also made with beautiful studs on the back cover of the wallet case. 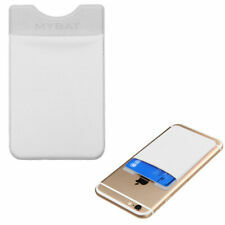 Secure magnetic flap to keep case closed and the phone scratch-free. Another great way to personalize your wireless experience! 100% new high quality generic (non-OEM). NO tools required for installation. Just snap-on original faceplate. Enclose your device in the highest quality, toughest case available. 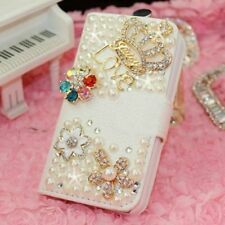 Adorable design make your phone more shiny,two card slots for your convenience. Stay with the Unique and Beautiful Design! Best choose For Christmas Gift.